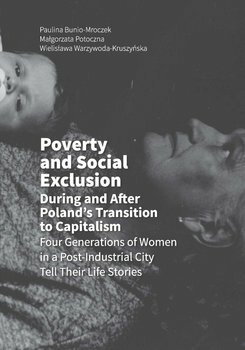 The book is about poverty in Poland during the period of system transformation and in the decade that followed, as documented in the life courses of consecutive generations of women living in the disadvantaged neighbourhoods in the post-industrial city. 69 life histories were collected. The authors analyse the life histories of four generations of women where the oldest are former workers in state-owned factories in which they worked until retirement and who used to be the avant-garde of the women’s working class during the socialist period. Their daughters, granddaughters and great-granddaughters occurred redundant on the capitalist labour market and lived on social benefits. The book is unique in both Polish and world literature since it goes beyond traditionally considered “feminisation of poverty” in monetary terms. It searches for poverty drivers and maintainers embedded in changes in industrial relations, welfare regime and family structures and relations. It also tells about women’ efforts and capabilities to cope with the disadvantage. The publication will be of interest to a broad audience composed of scholars concerned with poverty, social marginalisation and exclusion, officers in public and non-governmental institutions as well as to students of social work, sociology, pedagogy, psychology, social policy, gender studies and family science.